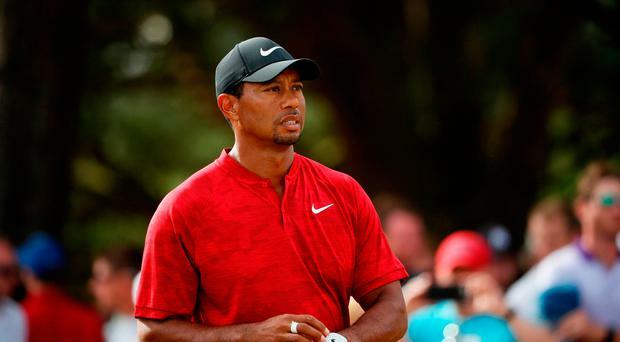 Woods held the outright lead at Carnoustie heading into his back nine, as he looked to end his decade-long major drought, but dropped three shots in two holes and he never regained the momentum. The 14-time major winner eventually finished three shots behind eventual champion Francesco Molinari. However, swept along by a massive gallery cheering his every move, this was the biggest indication yet since returning from a fourth back operation that Woods can compete at the highest level again. Daughter Sam, aged 11, and son Charlie, nine, were too young to see their dad in his pomp but they greeted him with a hug behind the 18th green. "I told them I tried, and I said 'hopefully you're proud of your pops for trying as hard as I did'," he said. "It's pretty emotional because they gave me some pretty significant hugs and squeezes there. "I know that they know how much this championship means to me and how much it feels good to be back playing again. "To me, it's just so special to have them aware because I've won a lot of golf tournaments in my career, but they don't remember any of them. "The only thing they've seen is my struggles and the pain I was going through. Now they just want to go play soccer with me so that's just such a great feeling." The 42-year-old's hopes of a remarkable comeback after a turbulent spell in his life - during which he has encountered off-course problems with the break-up of his marriage and a run-in with the law - were alive and well on the back nine. "It didn't feel any different. I've done it so many different ways," he added. "It felt great to be a part of the mix and build my way into the championship. Today was a day that I had a great opportunity. "It was a blast. I was saying earlier that I need to try and keep it in perspective because, at the beginning of the year, if they'd have said you're playing the Open Championship I would have said I'd be very lucky to do that. "I know it's going to sting for a little bit here, but given where I was to where I am now, I feel blessed. "It felt great to be a part of the mix and build my way into the championship. It was a blast. Woods was annoyed with his slip-up after the turn but insists he would not do it differently, although he was less impressed with a spectator shouting from a hospitality box at the top of his backswing on the 18th tee. "I flinched, but I've had things like that happen a lot in my career with people who just tried to time it," he said. "Unfortunately, that's part of what we have to deal with in today's game. People are trying to yell out things to try to be on TV or be on social media or whatever it may be. "That was too close to the game of play. "But I'm a little ticked off at myself for sure. I had a chance starting that back nine to do something and I didn't do it." By the time Woods and Molinari reached the 72nd hole, it was a long shot that Woods would win. But a random yell during his drive on the par-4 18th didn't exactly make Tiger fans happy. Woods did not seek out the fan but appeared to look in the direction of the shout. He can be heard saying, "No, what are you doing?" The resurgence of Woods helped boost attendance figures at Carnoustie to record levels for this year's Open. A crowd of 172,000 attended over the week, surpassing the 157,000 total set in 1999. "We have enjoyed a thrilling and memorable week of golf and Carnoustie's world famous links has shown why it is revered by fans and players all over the world as one of our sport's great championship venues," said Martin Slumbers, chief executive of The R&A.